Another of Menton's narrow winding streets in the Old Town. Note the shutters, top left, decorated with pots full of flowers. Don't tell anyone but they are not all real! 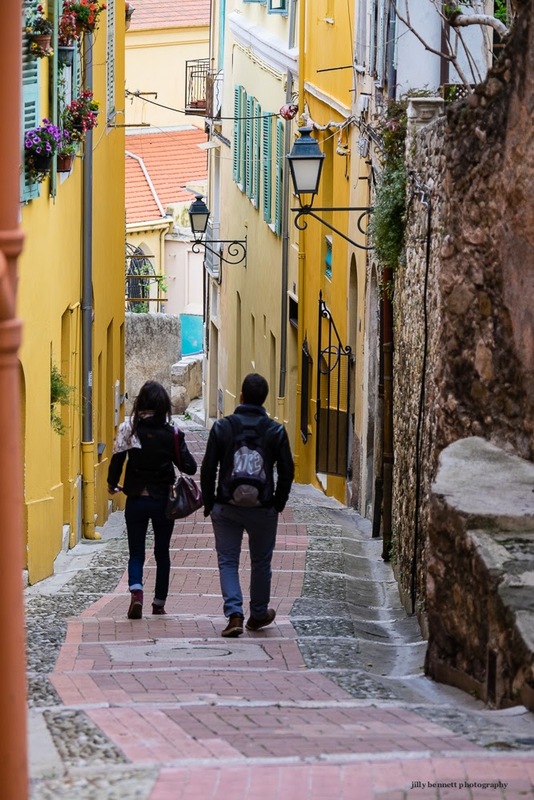 Une autre des rues sinueuses étroites de Menton dans la Vieille Ville. Notez les volets, en haut à gauche, décoré de pots pleins de fleurs. Ne le dites à personne mais ce sont des fleurs artificielles mélangées avec des fleurs vivantes! What a great little alley. I could shoot photos here every day. It looks like quite an incline, and I like the colours on the buildings. How strange in a village that is literally a garden all year round! Maybe they cannot be there to keep them watered. My window box took quite a hit during "La Chaleur" in 2003. Well, they add some colours. Perhaps they will have real flowers later? And I thought Menton had an ordinance against such things.